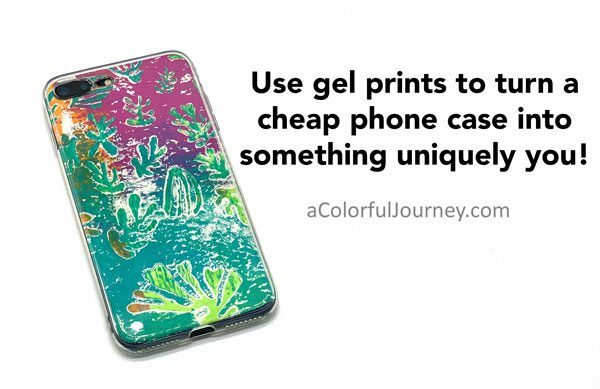 Use gel prints to turn a cheap phone case into something uniquely you! How can you turn a plain cell phone case into something uniquely yours? By using a clear phone case and putting any paper you’ve made in it. In the video, you’ll see an inexpensive $6 phone case become. You’ll see the easy way to get the exact template you need to cut your paper and the little trick at the end to get it all to fit. The super bonus of using a clear case and your own papers is that you can change it any time, as many times, as you wish! Want to know more about gel printing? I’ve got a whole bunch of YouTube videos here and if you’d like to go deeper, check out my workshop, Gel Printing FUNdamentals. You can use any clear phone case. There are lots of brands/manufacturers, and all I really look for is a cheap one that fits my phone. Be sure that whichever one you buy, that it is for your specific size of phone. The first thing you’ll want to do is pick some papers you love. I’ve grabbed a few since I couldn’t decide exactly which one I wanted. 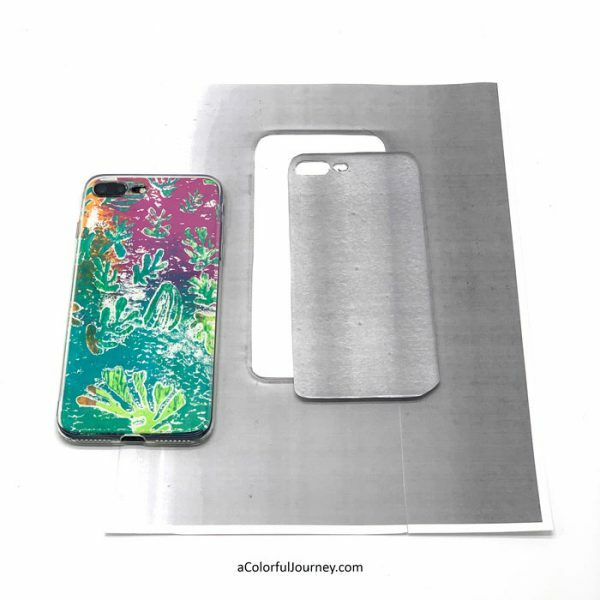 How the template is used will make it very easy to see what the finished phone case will look like. The stencil that was used to make these prints is the Cutouts Inspired by Matisse stencil I designed. To make the template that is exactly the size you need, simply photocopy your clear case, and cut it out. The full sheet of paper will be used as a big window to move around the prints to audition different areas. This makes it so much easier to know where to cut because you’ll see what it looks like for you get the scissors. When I put the phone in the case, the paper slid around. That made the cutouts for the camera not line up. So if that happens to you, take the phone out and reposition the paper. Then hold the paper in place with one hand while you slide the phone in with the other. 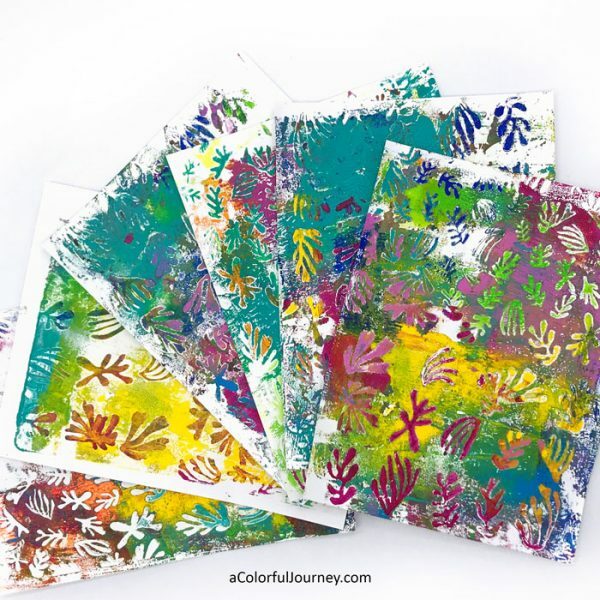 Looking for more gel printing fun? I’ve got a whole page of resources for getting started, techniques, and ways to use your prints here. Thank you for accepting my application I just wanted to say what a truly wonderful blog/newsletter and more you have. I have got to ration my time or I won’t get anything done but sincerely thank you. I am looking forward to my journey I have been learning mixed media with Tamara LaPorte in Lifebook 2019 and Mimi Bond in No Shenanigans. So I have that pretty much covered even though it would take more than my lifetime to learn everything. But I haven’t seen much on Gelli Printing and I have found my Gelli home. So a sincere thank you and I will try not to bother you. I did mention when I applied for the FB group that there is one thing I can’t do and that is take a pic of my own work because of my very poor eyesight but my husband will take them if that’s ok and he can also take one of me working on it for proof. Thank you God Bless you and I’m ready to have fun. I have been wantung to try gelli printing forever! Bought a small set of shaped gellis back in April, but…sadly still in the package. I have not created in forever. Hopefully tomorrow will get me re-started!